Newton Home and Park 4650 Estero Blvd. 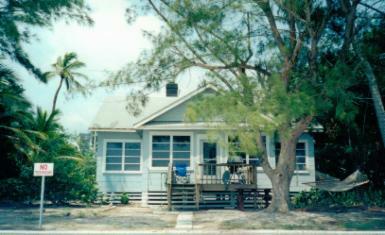 To some, the Newton home, pictured here on Ft. Myers Beach, tells the story of a vibrant family who shared a lifetime of solace and adventures here. It began in Ft. Myers during Florida's 1920's real estate land boom, when Jim Newton served as president to develop 55 acres of land, which became the residential district called "Edison Park". 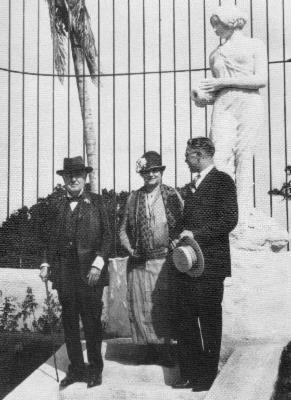 Jim, seen below at the entrance site statue on opening day, with Mr. and Mrs. Edison, was 20 years old. Directly across the street, on McGregor Blvd. is the home of Mina and Thomas Edison, Isabel and Henry Ford, and the place where Clara and Harvey Firestone all spent their winter months. For Jim Newton, all three family friendships originated at this park statue entrance, which still stands today overlooking the grounds of these remarkable friends. It was also here that Jim was given the opportunity to later serve as Firestone's personal assistant while based in Akron, Ohio for 8 years. 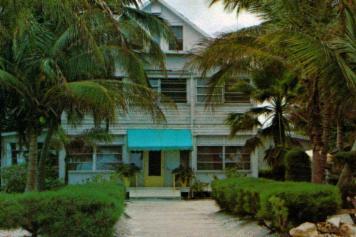 During this time Jim's parents, Dr. Robley and Jane Newton purchased the old Winkler Hotel on Ft. Myers Beach (above) and renamed it the Beach Hotel. Dr. Newton was Thomas Edison's physician, and his wife was good friends with Jane Newton, as they visited together often. As the Beach Hotel became one of excellence, it too saw its share of famous and distinguished guests from around the world who visited and returned often to visit the Newton family. In the years that followed, Jim had the opportunity to meet Dr. Alexis Carrel who introduced him to Charles Lindbergh, of aviation fame in 1938. It was Lindbergh who later served as best man when Jim married Eleanor Forde in 1941. The following year Jim was inducted into the Army and five years later released as Major Jim Newton. 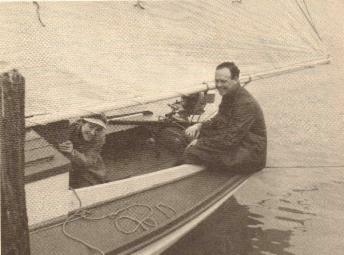 During these pre and post WWII years, Jim and Ellie Newton, with Charles and Ann Lindbergh enjoyed memorable sailing trips from the beach area into the Everglades and Keys. A bond of friendship strengthened as the Lindbergh children visited the Newton cottage often. It was built in 1953 and named "The Seven Seas". 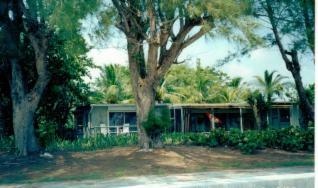 Jim continued to work in real estate from his home here, and Ellie wrote memorable works while both entertained numerous worldwide friends who visited in their next door guest cottage, seen below. In 2003, the Town of Fort Myers Beach acquired the historic Newton home and site, which today is named Newton Park, to pass on friendships for new generations as new footprints emerge.